Clean the cauliflower, remove the outer leaves and the core. Put the tops in the boiling salted water and cook for 15 mins. Meanwhile prepare the béchamel: in a saucepan heat the milk, while in another pan melt the butter gently. Brown slightly then add the hot milk, stirring with a whisk. Continue to mix to avoid the lumps, season with nutmeg, pepper and salt and let the mixture thicken for a few minutes, stirring constantly. In the meantime the tops of cauliflower will be ready, carefully drain them and keep them aside for aside. Butter a 20x20cm batch and pour the cauliflower tops. Cover with béchamel sauce and then sprinkle with Parmigiano. Season with black pepper, and then bake in a preheated oven at 180° in static mode for 10 mins. After this time set the grill mode to 220° and cook for another 10 mins, so as obtain a golden crust. 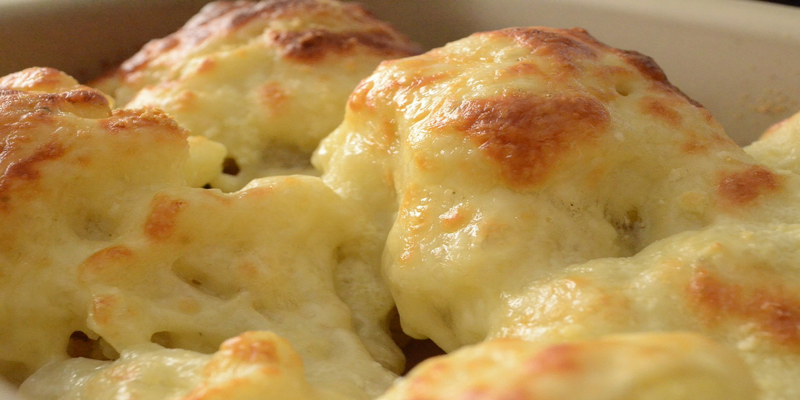 Your gratinated cauliflowers are ready to be served!